I have known about the Kid Brooks for years, having done a little on-line trawling in the past to try to understand why Blackheath Village, whose contours would suggest that it is in a river valley which extends into Lewisham, seemed to be devoid of any waterway. The ‘discovery’ of the Upper Kid Brook (now with its own post) and its course through ‘The Village’ led to the realisation that there were two other Kid Brooks and that the end of the Lower one was on a playing field I knew well. It is thus entirely logical then to start with the third Brook, Mid Kid Brook. Its source, according to the fantastic and usually reliable Edith’s Streets, is to the east of the Brook Hospital site, possibly from a pond at the former Hill Farm, (the entrance to which was around where Corelli Road is now). The source was probably covered when the Brook Hospital site was originally developed, and a ‘gated community’ was built after the Hospital closed around where the source may well have been. 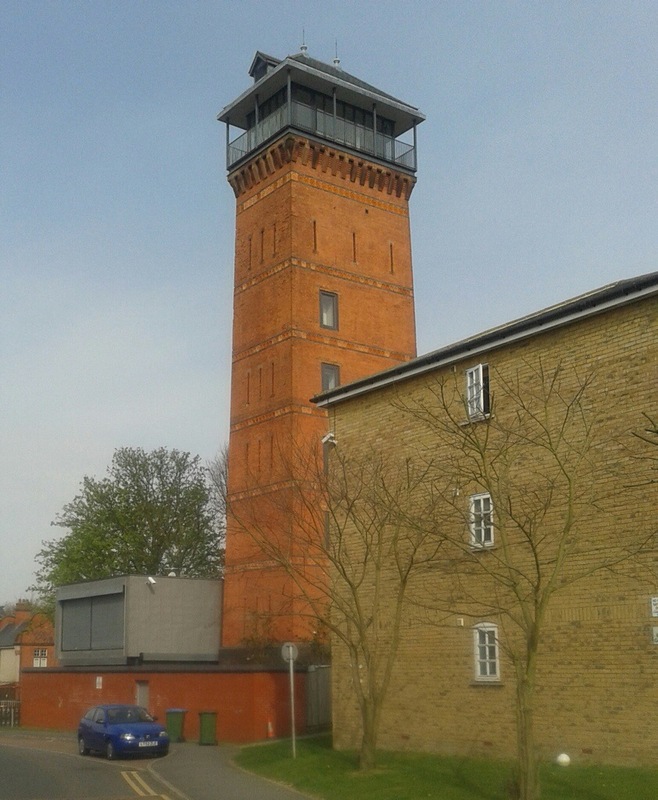 One of the few remaining bits of the fever hospital site is the old Water Tower, and for the want of a more tangible source, it seems as appropriate starting point for following the course of the Mid Kid Brook. Maps produced prior to the development of the area show the Brook flowing westwards, parallel to Shooters Hill Road, passing the former Brook pub (now a Co-op). Certainly at that point it could not be too far away from the main road at the land falls away to the south about 30 metres away from the road. 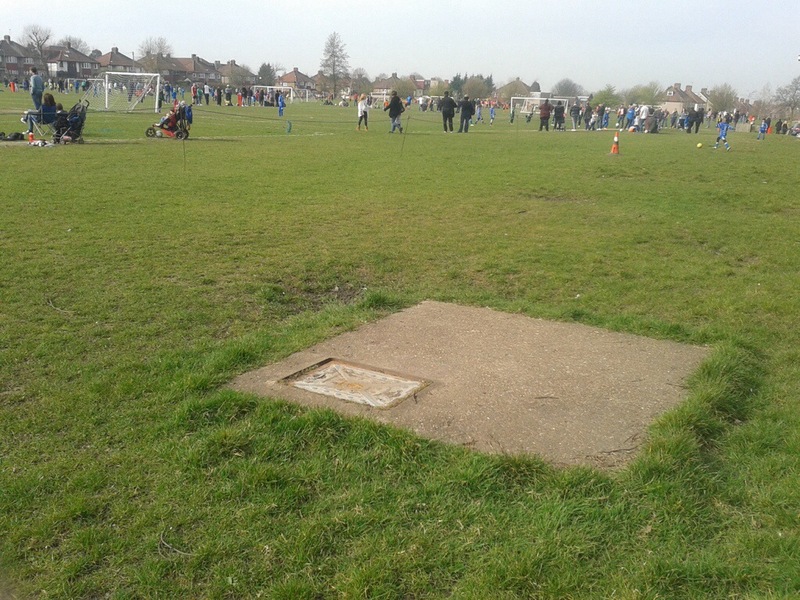 The first ‘sounding’ of the Brook may be in the London Marathon Playing Fields – there is a large manhole cover and a sound of running water underneath. It may just be wishful thinking on my part though, given the topics the blog covers. 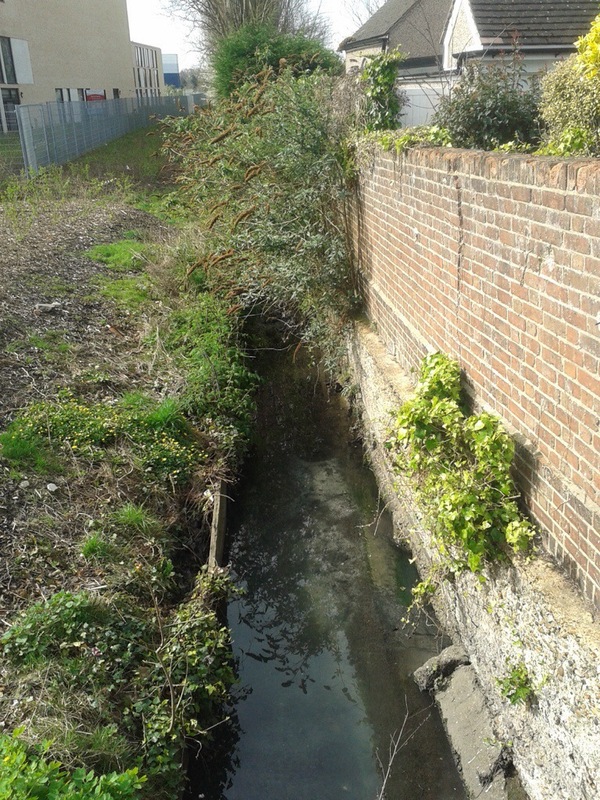 Edith’s Streets has the Brook flowing parallel to Shooters Hill Road to opposite Marlborough Lane latterly behind a parade of shops, although there is nothing there to show its course in the jumble of dumped rubbish, broken fences and abandoned outbuildings. Just beyond there the Brook turned back sharply on itself at a farm that has long since disappeared – Arnold’s Farm. The name lives on though with a sheltered housing scheme, in the general location of the farm – Arnold House. There are parallels with the modern housing at the former Brook Hospital site, between 1881 and 1948 it was the site of the Blackheath and Charlton Cottage Hospital (the Cottage being dropped just before WW1). 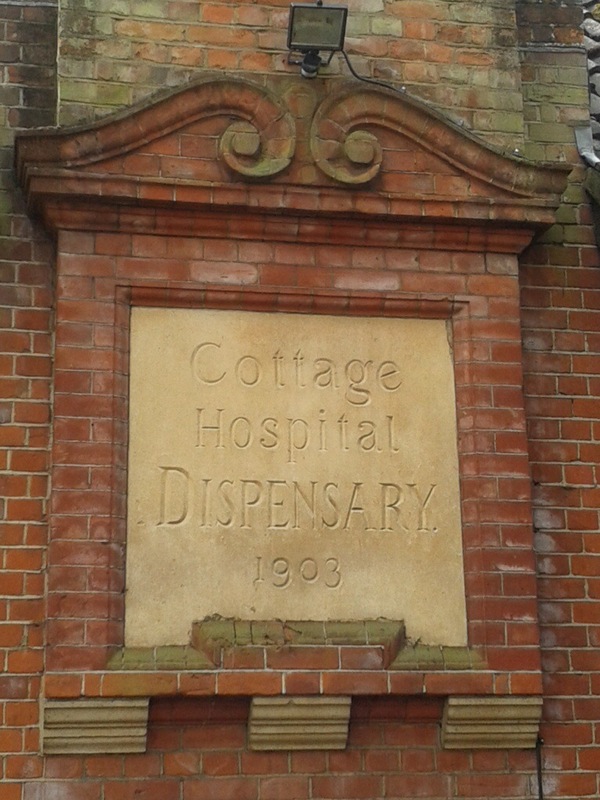 The small dispensary is all that remains of one of a large number of hospitals on Shooters Hill Road. The pre-development map of the area has the Brook meandering south-west towards the current A2. The exact route is difficult to work out, although the on the ground contours would probably suggest a route that included Begbie Road, the playing fields on Wricklemarsh Road, and going behind houses on Holbourne Road and crossing Woolacombe Road just north of Dursley Road – just to the north of the former location of Manor Farm before crossing what is now the A2. On the far side of A2 the exact locations become a little clearer, aided and abetted by a street name, Brook Road, and some gentle contours, which sees the Brook flowing under the edge of a small meadow behind St. John Fisher church and then under the church drive. 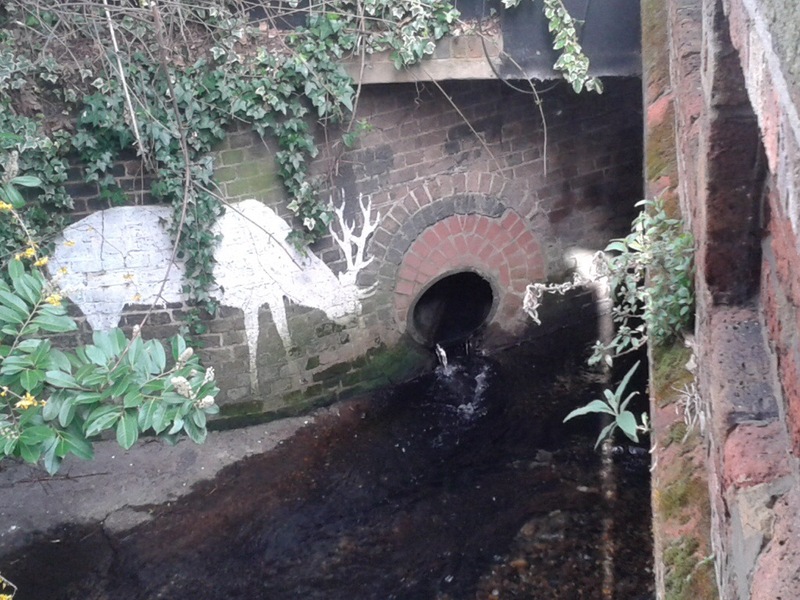 Opposite the church, on the other side of Kidbrooke Park Road, is our first sighting of the Brook – emerging from underneath the road and running alongside Thomas Tallis School. While it is then apparently visible as the boundary alongside the Blackheath Girls School playing fields, there is no public access. The next clues as to its course are on Casterbridge Road on the Cator Estate where the contours and manhole covers with the sound of water underneath suggest a likely route. The next sighting is more obvious, the pond on Casterbridge Road. This is likely to be the remains of one of the former ponds from the Wricklemarsh Estate (the other being on what is now Pond Road), certainly the Mid Kid Brook originally fed a pond in roughly this location. The remains of a bridge over the Brook are still there and there is a clue as to the course in a street name, Brookway, after which it crosses Foxes Dale and its route becomes apparent again (although without any obvious sign of water, but oddly it is marked on various modern maps in blue) between two houses before disappearing in a sink in the garden of a house on Lee Road, as I confirmed a few weeks ago. The sink takes the Brook across Lee Road, where there used to be a small bridge, before following a the western side of the road a couple of hundred metres to Lee Green where it joins the Quaggy next to the Lewisham side of the bridge..
Its final outflow from a pipe provided a picture of what I would have imagined happening further upstream perhaps 300 years ago – a deer drinking from the Brook. Alas it is not a real one, but it is the next best thing, and one that is rather more permanent feature – one of the delightful works of Lewisham Natureman, that appear in all sorts of odd places – a Blackheath Banksy perhaps? This post is a part of a series on the Quaggy and its tributaries which are brought together here. Postscript – a later post suggests than the current course from the ‘sink’ may not have been the original one and that Mid Kid Brook may have originally flowed westwards, roughly along the line of Lee High Road, to join the Quaggy nearer Lewisham. 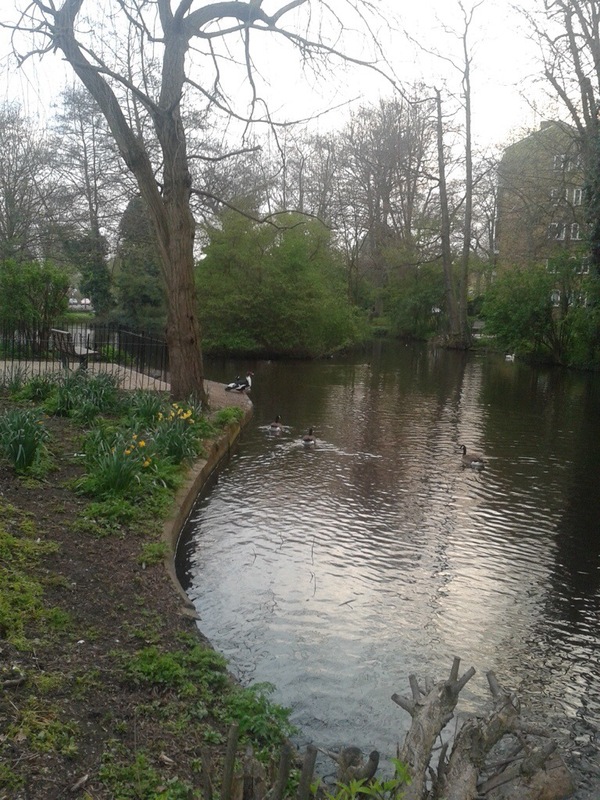 This entry was posted in Greenwich History, Rivers and tagged Kidbrooke, Lewisham Natureman, Mid Kid Brook, Quaggy, Shooters Hill on April 2, 2014 by Paul B. Thanks – getting rather close!! Just stumbled across blog, do some South London psychogeographical running myself. A couple of us have a plan to run the length of the Ravensbourne later in the year, from Keston Ponds to Deptford Creek (you can run much of it though some of it is on private land). We reckon it’s about half-marathon distance, are you up for it?! I might well be interested in doing that; it is a river I know quite well and have run alongside most of those parts that are accessible other than those going through Bromley Common. Thanks for visiting.